A lot of pundits like to put down the Linux-based Chrome OS for being deficient compared to more mature desktop operating systems. True, both Windows 10 and macOS are far more useful and powerful -- for now -- but the beauty of Chrome OS is its simplicity. It is arguably the most secure platform too, least likely to experience malware and vulnerabilities. Chromebooks rock, y'all! With all of that said, Android app support is slowly being rolled-out to some Chromebooks, potentially making them much more useful. Hopefully this does not impact security, however. Today, Acer announces a 13.3-inch touchscreen convertible called 'Chromebook R 13'. While it will not have Google Play support out of the box, Android app support is being promised by the end of 2016. "The new Chromebook R 13 is the industry’s first convertible Chromebook with a 13.3-inch touchscreen display. It has a flexible design that can be used in nearly any position including as a tablet thanks to its 360-degree hinges. It provides up to 12 hours of battery life and will provide additional capabilities thanks to planned support for Android apps via the Google Play Store later this year", says Acer. The company further shares, "the display provides integrated 10-point touch capabilities that support Tap, Swipe and Pinch-to-Zoom gestures so any web page or app can benefit. The display is complemented by an HD webcam (1280x720 resolution) with High Dynamic Range imaging and 720p HD audio/video recording and an integrated microphone for webchats. HD audio with dual built-in speakers placed on the lower portion and sides of the Chromebook perfectly complements the display for first-rate entertainment". While the computer has 4GB of RAM, which is wonderful, I am not crazy about the processor. Rather than utilize a tried-and-true x86_64 Intel chip, Acer has opted for a low-cost MediaTek ARM variant. With that said, the MediaTek M8173C Core Pilot quad-core processor could prove quite peppy, but I will not hold my breath. Consumers should wait for reviews and benchmarks. Acer shares some notable specs below. Questionable processor aside, it looks like a real winner. I have been testing a different Acer Chromebook lately, the R 11, and it is quite good. The build quality is solid, and both the keyboard and trackpad are satisfying. I expect similar quality from this new Chromebook too. Regarding Android app support, Acer is smart to hold off on Google Play for the R 13 at first -- better to make sure it is a satisfying experience before delivering it. Some Android apps work well on Chrome OS, but it is certainly not flawless. 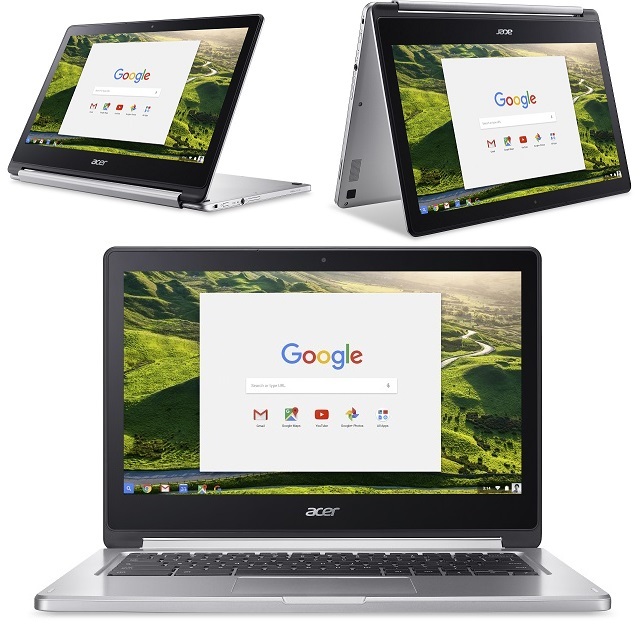 If you want to buy the Acer Chromebook R 13, you can pick it up for $399 in October. Unfortunately for Acer, this is well beyond back-to-school shopping, meaning it is a missed opportunity. Will you buy the Acer Chromebook R 13? Sound off in the comments.